Info "I gotta change my look. Shave it all off for me!" Shaving Scream is a microgame in WarioWare: Smooth Moves. It is one of Wario's games. Its name is a pun on "shaving cream". 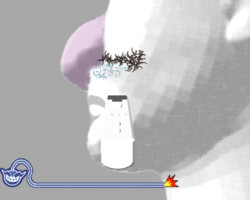 Like Cutting It Close from WarioWare: Twisted!, it features shaving hair from a man's face. In Shaving Scream, the player will have to use the Wii Remote pointer and shave Wario's face. Each level of difficulty involves the player shaving off more and more hair. After all of Wario's facial hair is cut off, he will blush. 1st level difficulty: Wario only has either a sideburn or a mustache. 2nd level difficulty: Wario either has a beard or sideburns. 3rd level difficulty: Wario has sideburns and a beard or has a circle as his beard. This page was last edited on February 18, 2018, at 19:30.